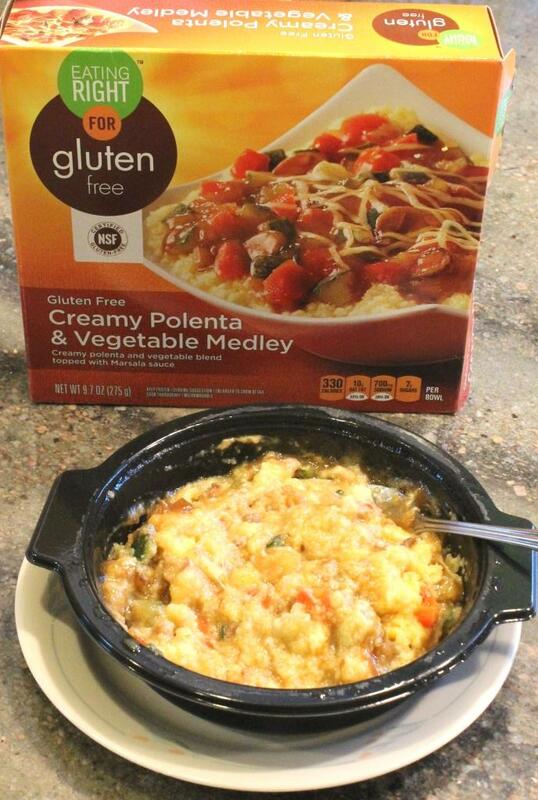 This dish by Eating Right is described in small type on the package as creamy polenta and vegetable blend topped with Marsala sauce. Honestly, I’m not sure how I feel about this. 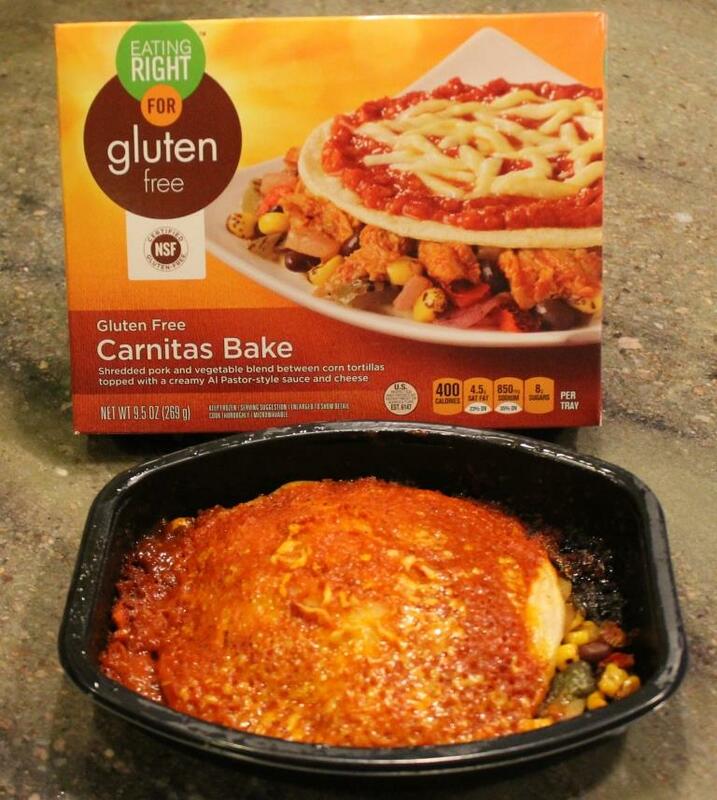 The first time I tried it, I assumed by the photo on the package front – which is loaded with diced tomatoes and sprinkled with melty cheese – that it was going to taste like tomato sauce. But instead I got the Marsala sauce, which has a little sweetness to it that just doesn’t seem right with this dish. I thought maybe that since I was expecting one thing but got something else, that might have been my issue with this. So, I tried it again. This time I added some cooked, cubed chicken for a little more protein. I feel the same way about it. I really think it would be better with tomato sauce (and I’m not a big tomato fan) than with the Marsala. Don’t get me wrong, it doesn’t taste badly at all, there’s just a disconnect in the flavors, in my humble opinion. And I don’t get the “creamy” in the name – do they mean the polenta is creamy? I dunno. For $2.99 (at Safeway), 330 calories, 18 grams of fat, and 8 grams of protein…. If I want comfort food, I’d rather go with the Homestyle Chicken & Rice Pasta, which is lower in fat and higher in protein. Recommended? Eh. I dunno. I won’t be buying it again. I know what you’re thinking: what’s a Yankee with a sensitive palate doing eating a Carnitas Bake? Answer: living dangerously. I have to say, this Carnitas Bake by Eating Right is a bit spicy, but I’m picking the green peppers out, so maybe that’s toning it down a bit. Okay, and I’m also picking out whatever looks like a red pepper. I will be honest, I actually like this. It does have a kick to it, but I don’t mind it. The overall flavor is pleasant and a bit on the sweet side. I guess that is balanced out by the peppers for most people. The consistency is fine – I cooked it for 5-1/2 minutes and just the very outside edges of the tortillas got a little hard and crispy. It probably could have gone for 5 instead. There is plenty of meat which is moist and not chewy. It holds its heat for a nice, long time, too. 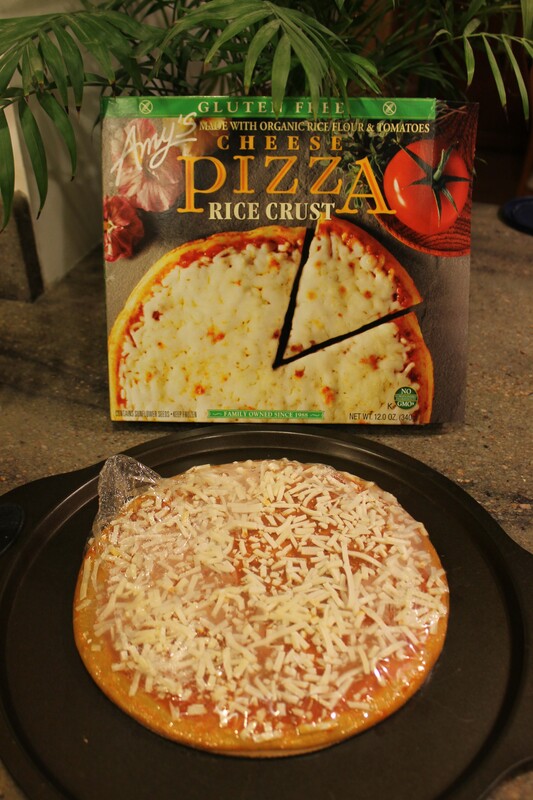 My only suggestion would be that you might like to add some grated cheese across the top of it. I think it would be great with some guacamole and sour cream. So, if you want something a little spicy for only about $2.99 – this is a winner. Available at Safeway. Chex, we love you. Gluten-free instant oatmeal is here. Quaker Oats, why didn’t you guys think of this? Sheesh! In a variety box of Chex Gluten Free Oatmeal, you get 2 packets each of 3 flavors: apple cinnamon, maple brown sugar, and plain. It’s super easy to make in the microwave in less than 2 minutes, and each packet comes with a convenient fill-line for milk or water (I always use milk for creamier oatmeal) so you don’t have to dirty a measuring cup. Great flavor, great consistency, awesome job, Chex! But now, I bet you’re wondering why Nutella is in the picture. Okay, I’ll tell you. How many kids do you know (young OR old) who like plain oatmeal? That’s one drawback of variety packs of any kind – there’s always one flavor no one wants. Why do they do that? In any case, here’s a quick, easy, and delicious solution to the plain oatmeal issue. 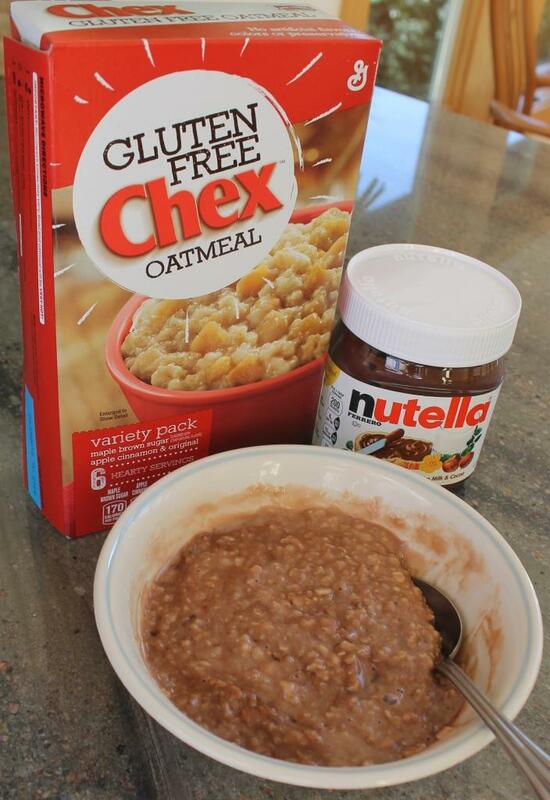 When you’re done heating the oatmeal, stir in up to 2 tablespoons (1 serving) of Nutella until it’s thoroughly mixed. You will end up with one delicious bowl of oatmeal! Yes, I know, I’m a genius. You’re welcome. You can learn more about the most awesome Chex Gluten Free Oatmeal at http://www.chex.com/products/gluten-free-oatmeal-multipack-variety-pack I got mine at WalMart for under $3.00. Enjoy! I have seen the face of evil and I live to tell the tale. 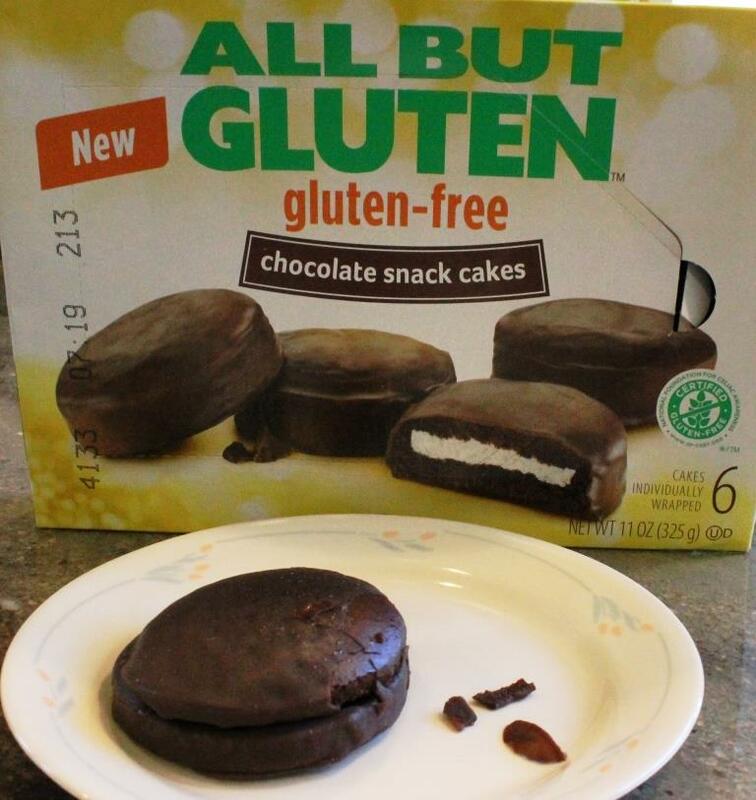 These All But Gluten Chocolate Snack Cakes are probably the “falling apart” equivalent of RingDings. (I mean, come on, we all know that GLUten means glue. 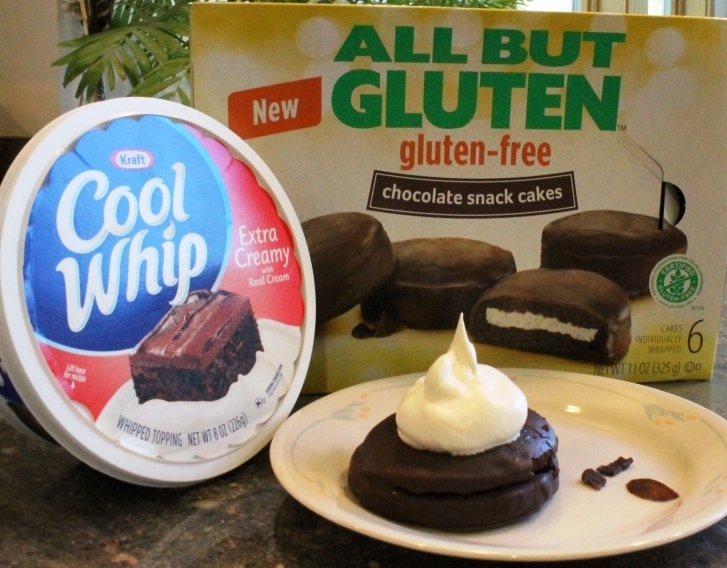 So gluten-free stuff falls apart. A bit. Who cares as long as the consistency is good and it tastes awesome, right?) And my oh my are they good. Like evil good. Like no self control good. I thought they were a little light on the cream filling and the cake was just a little on the dry side, but no worries, I am like MacGuyver with Cool Whip. What a treat for dessert or in between meal snacks or like in place of a meal or for breakfast or… Oops, sorry. This time, I was prepared. At least I hoped I was. On a recent trip to Safeway trolling for gluten-free foods, I found Wolfgang Puck Free Range Chicken with White and Wild Rice Organic Soup on sale. So I got a can. 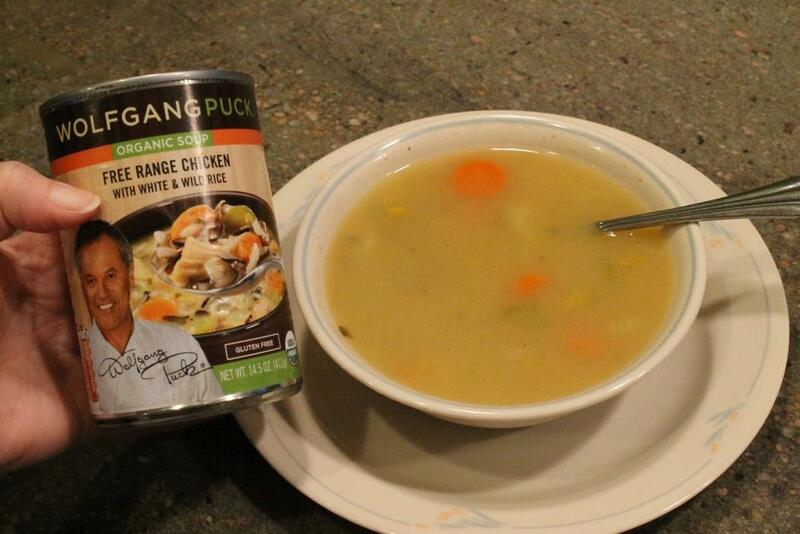 I heated one can of soup in one bowl (see photo). It says on the can there is enough for 2 servings, but I beg to differ if you’re serving it as a meal. If you’re serving it as an appetizer, well, you can probably get away with that. I cooked it for 2-1/2 minutes on high as per the instructions. I recommend putting a plate underneath. It didn’t boil over, but there was a lot of condensation under the microwave-safe cover. 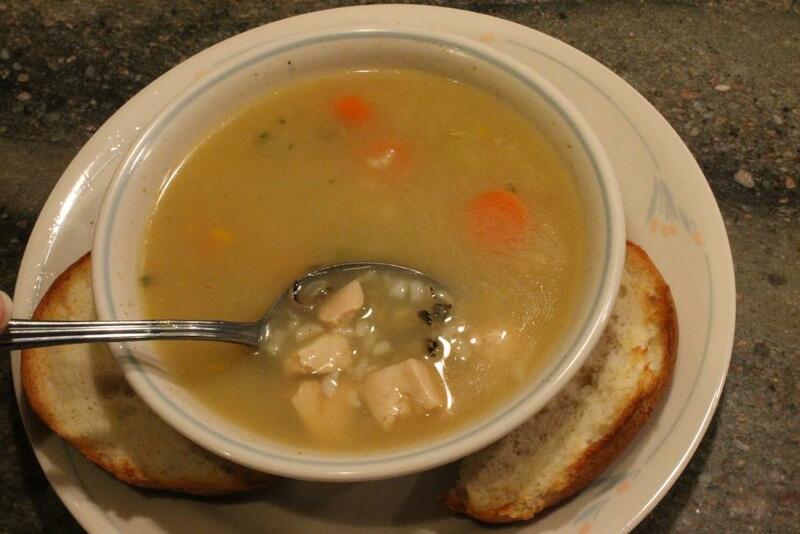 The broth was not runny – it was a nice thickness for dipping toast or crackers (or in my case, 1/2 an Udi’s bagel). The texture of the rices was very good. The chicken chunks were a little tough, but not chewy or nasty. My sensitive palette would have liked just a tad less paprika, but for normal people, I’m sure it was fine. Would I buy it again? I consider this one of those “break glass in case of emergency” foods, so yes. I have a container of Pacific Foods g/f chicken soup ready to try next. We’ll see who wins the spot on my lazy Susan. I was so very excited when I saw pizza in the gluten-free freezer case at WalMart. Pizza is one of the foods I really do miss from my gluten-mongering days. So when I saw both Amy’s and Udi’s had gluten-free pizza available, I grabbed them. If you have food allergies, you know that little things can make a big difference. Many foods, especially salads, have been ruined for me. So when I found two alternatives to croutons for people with gluten- and/or wheat-intolerance, I got excited. Since I have always been a fan of croutons, it was time to take the dive and try these. The first type I invested in was the Olive Oil & Garlic Gluten-Free Croutons by the Gluten-Free Pantry. They do contain eggs, corn and yeast. They do also contain a lot of flavor. I located my first package of these wheat free croutons in the gluten- free section at an NRG Organic Supermarket on the East Coast. They were so good that I went back for more and they were already out. They never got more in. A couple of years later, I gave in and ordered some online. The consistency of this package was different, in fact, they were rock hard. I’m uncertain if they changed the recipe, or if it was just a lot inconsistency, but for some reason they weren’t as enjoyable. The flavor of the first package was good enough, however, that I would give these a try again sometime. One afternoon I was in the produce section at Safeway when I discovered the Fresh Gourmet Tortilla Strips Lightly Salted. It states “Naturally Gluten Free” right on the front of the package. I like these “Crunchy Toppings for Salad” for a number of reasons. The list of ingredients is literally this short: corn masa flour, safflower and/or sunflower oil, salt, trace of lime. I like things simple. I also like that they are easy to break up, and that they add a great crunch to salad. I have even use them on top of soup instead of oyster crackers. Either way, if you are missing the crunch or that little extra substance to your salad, either of these products should fit the bill. Ingredients: corn starch, tapioca starch, water, liquid whole egg, chickpea flour, canola oil, sugar, extra virgin olive oil, xanthan gum, garlic powder, yeast, salt, spices, cream of tartar. Tortilla Strips by Fresh Gourmet – 3.5 oz ~ $2.00 on sale. Ingredients: corn masa flour, safflower and/or sunflower oil, salt, trace of lime.